Vegetarians rejoice! The Meatless Monday movement has hit such a high stride that even my beef-loving father has likely caught wind of it by now (regretfully). The organization behind the movement – the official Meatless Monday Campaign – is hoping you observe an early “meatless Monday” today, Thursday, February 28, to celebrate National Chili Day. If you’ve ever thought good chili had to have meat, raise your hand. At one point in life, my hand was raised, too. But that was before exploring the joys of vegetarian chili myself. Now, I consider myself a meat-free chili believer, and it feels good to be on the other (healthier) side. Today the Meatless Monday Campaign is celebrating this otherwise meaty holiday in true vegetarian style by introducing a free digital cookbook loaded with 10 meat-free chili recipes for your winter delight. The ”Monday Chili Cookbook” includes tons of helpful information about how eating less meat is not only healthy for you, but also the environment, as well as the “history of chili” in America. The recipes are adventurous yet approachable, even for the novice cook, exploring ingredients like artichoke, cashew, and even quinoa. One of the recipes that has us most intrigued is the Bloody Mary Chili, which boasts whole tomatoes, minced garlic, Bloody Mary mix, three kinds of beans, and plenty of cumin and chili powder for added spice. Now that’s a Bloody Mary I’d love to get my hands on. 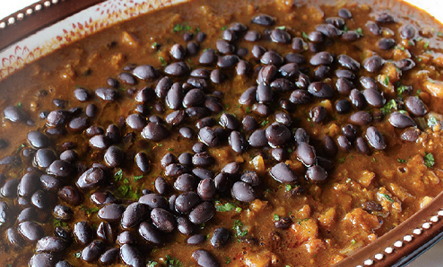 Download your free Monday Chili Cookbook and start enjoying it today. And if you’re hungry for more meatless recipes, be sure to visit MeatlessMonday.com where you’ll find hundreds of healthy recipes, as well as tips and tools to take (meatless) action in your community. Like to try new things. Thanks. I made Vegan Chili this past Monday! So good! Roasted garlic, bunch of different peppers, black beans, white beans, kidney beans and garbanzo beans, roasted carrots for texture, splash of coffee some vegan choc chips and soooo much more! Thank you County Fair for all the wonderful organic produce! We gave up meat for Lent this year and I'm surprised not to miss it. This looks lovely. Thank you. Thanks, I've been looking for some good vegan chili recipes.